The object of this festival is expiation of the sins of omission and commission arising in the dailu worship and other religious rites performed in the temple. It is therfore a purificatory ceremony. 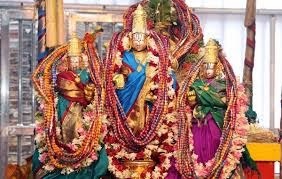 The anual pavitrotsavam of Lord Venkateswara is held at tirumala for three days from the Dasami of the Suklapaksha in the month of sravanam (August). The divine energy which permeates from the holy temple is recharged by the recitation of mantaras, vedic chantings, recitaitions of the prabandham and performance of homams. the deity is later decorated with pavitrotsavam garlands dued in five colours looking like a garland of beads. . This cermony is held for three days. For further details contact our call centre: 0877-2277777,2233333.